If you're concerned about the future of humanity and the natural world, and you should be because it's your future, please also visit the official websites listed below. Damage to the environment happens too slowly for anybody under the age of 30 to notice. And in the case of damage to the marine environment, it happens where you can't see it. I'm a Brit, and the marine environment round parts of southern England is as damaged as almost anywhere in the world. When I first went to Cornwall as a young child, you might look down from the top of a cliff and see dolphins by the dozen turning the water gold or silver. In most parts of Britain, anybody in a small boat would expect to see seals on a daily basis, and never to be out of sight of sea birds like fulmar, gannets and guillemots, never mind common sea gulls. Every town and village around Britain had a very healthy inshore fishing fleet. The offshore fishing fleet was catching cod so big it could take two or three people to get one out of the water, and fishing made a major contribution to the economy. I'm talking about 40 years ago. "Oh, well, 40 years is a long time, you've got to expect changes". Is that right? Back when I was at university 30 years ago, I could cook enough raie au beurre noir for two hungry people with a single skate wing from the local fish shop. These days, if you want fresh local skate it's expensive and so small you need the whole fish to make dinner for two. The North Sea and Channel waters around large parts of England are so severely damaged that you can go a hundred miles without seeing a seal, fulmar, gannet or guillemot. Atlantic cod, unbelievably when the fishing industry has been regulated for over a hundred years, is now under threat of extinction. It's not just Britain or even Europe. There are similar problems around the costs of the USA, China and Japan. We have this impression of jolly fishermen in yellow slickers, chugging out to sea, struggling with wind and rain, before coming back to their loving families. All that may be true, but motorized commercial fishing is a disaster for itself and the natural environment. Local fishermen increasingly find it difficult to catch enough fish to pay for their fuel because the larder has been scraped bare. Literally, scraped bare. Marine species usually have a very small home territory, in which they live for a long time, getting bigger and bigger if undisturbed. What if every three or four months a heavy steel and nylon trawl descends from heaven and scrapes the area flat? And there's the choking clouds of dust too, as in this quote from Wikipedia: "One bottom trawler can put more than 10 times the amount of suspended solids pollution per hour into the water column than all the suspended solids pollution from all the sewerage, industrial, river and dredge disposal operations in Southern California combined". Is bottom trawling insane? Yes, clearly. So why do we do it? And why do we have agricultural and industrial techniques that pour toxic waste into the sea? Because we never think more than five or ten years ahead. "Systematic destruction of the Earth's natural and nature-based resources has reached a point where the economic viability of economies is being challenged - and where the bill we hand to our children may prove impossible to pay". From a briefing by the Executive Director of the United Nations Environment Program, 2007. It's all about numbers. About 95% of human problems (cost of living, cost of oil, quality of food, psychological stress, legal restrictions, pollution, traffic jams, unemployment, poverty, urban decay, famine, water shortages and most wars) resolve down to one problem. A high and increasing human population. Until quite recently, humanity's numbers on Earth were stable at about 250 million. 250,000,000 is quite a small population for a planet. On average, each couple had two children who survived into adulthood. If we still had a small population, everybody could have a big house, air conditioning, swimming pool, TV, computer, new car, two ponies and a powerboat. Everybody could eat food from the other side of the world, buy a second home by the sea, enjoy fishing, parachuting and three foreign holidays a year, work four days a week and retire at 50, and the natural environment would cope with this very well. In the 18th century the population balance was tilted by the development of efficient agriculture and human numbers first reached 1,000 million (one billion). In the 19th century efficient transport, healthcare and new standards of hygiene meant a sharp rise in human numbers which continues today. In the last eighty-five years, a single human lifetime, the number of people on planet Earth has risen from less than 2 billion to 7 billion. 7,000,000,000 and growing. That is huge. The consequences of overpopulation are already severe for wildlife. Unless we use our intelligence now, it is not only wildlife but our own grandchildren who will suffer and die. The largest population increases have been in poorer countries, but overpopulation is more about consumption than it is about numbers. A human who lives in a wooden hut and eats one bowl of rice per day has little impact on the local area and none at all on the planet. It's the number of high mass consumers who make the difference, so we're really looking at the number of Americans, Europeans, and increasingly of Chinese people. Since the Second World War the population of the USA has more than doubled from 140 million to 308 million. In the same period the population of Britain has increased from 40 million to 61 million. Nearly half of that was in the last 10 years. To sustain humanity's current levels of population and consumption we need all the resources of our own planet - plus half of those of another planet as well. “By 2025, two-thirds of people will be living in water-stressed countries”. United Nations. Overpopulation is the most important topic of all but it's the hardest for us to face. To most of us, no solution is necessary because there is no problem. There's still a lot of countryside around every city, it's all green and peaceful, if you want bears, wolves and foxes it's best to have them on TV not chewing on your sheep, dog or baby, it's probably all exaggerated anyway, and we've got other problems that actually do need thinking about. As a citizen of a democratic country, if you want to work hard and have three children, a dog, a car, a boat and two or three foreign holidays a year, no politician is going to argue with you. But are your grandchildren going to thank you? Maybe not. “All environmental problems become harder - and ultimately impossible - to solve with ever more people.” David Attenborough. More personal freedom, with more time off and more open space to enjoy it in. More wealth. For the following reasons, each of us would now be able to pay our bills easily despite working fewer hours. Much cheaper land prices. With (say) only a quarter the population, anybody who wanted some land could have a good piece. With less land needed to produce food there would have been a higher proportion of woodland and natural grassland in every country. Much cheaper coal and oil, which would not be about to run out by the end of this century. Again, this is supply and demand. Less expensive food, as a direct result of having cheaper land and oil. Better housing. Instead of building millions of small new homes with cheap materials, building on river flood plains and reclaimed industrial waste tips, we would have had plenty of time, timber and stone to improve existing housing. Lower taxes, because the state would not be running around trying to meet an ever-increasing demand for cheap housing, wider roads, more clean water, higher capacity sewage systems and waste disposal, and minimum healthcare and social services for the new billions. Better education and healthcare. There would have been plenty of time and money to build good schools and hospitals, and run education and healthcare. Less conflict. Wars and terrorism are usually blamed on political or religious ideology, but you don't often see serious fighting by people who have plenty of food, housing and healthcare. Well, back in 1910 we missed the opportunity. But it's not too late to make things an awful lot worse by continued population growth. Politicians and industrialists sometimes say that we need more people to power progress by providing labor and ideas. It's a point of view, and maybe it's right that computer technology would make slower progress if Silicon Valley had a smaller pool of talent to recruit from, or if there weren't several billion people buying computers and software. Then again, the great art, music, churches and cathedrals of Europe were created mostly by communities of five to ten thousand people. The incredible Italian Renaissance town of Florence (Firenze) was built by a population of only 60,000-100,000. Venice was built by a population of about 150,000. The total population of Renaissance Italy was only 6 million. The Renaissance did not follow a period of population growth but a plague that wiped out about one-third of the inhabitants, and it produced Leonardo da Vinci, Michelangelo, Raphael, Petrarch, Boccaccio, Giotto, Brunelleschi, Donatello, Botticelli and Titian. Italy now has 60 million people and like most hectic, crowded modern countries it just has celebrities. Back in the 1960s many writers and broadcasters were aware that a population explosion had started a few decades earlier. They saw signs of it all around and didn't hesitate to say so. Today, population has become the last taboo, the subject the media won't touch. One exception was on 9 December 2009 when BBC1 broadcast David Attenborough's Horizon program How Many People Can Live On Planet Earth? For readers who aren't British, we'd better explain that the BBC is funded by a licence fee so it does not have to keep its advertisers happy, and David Attenborough had spent more than fifty years as Britain's favorite naturalist and wildlife presenter so he could say anything he wanted to. Since the Industrial Revolution of the 19th century there has been a constant steep increase in human numbers. Through agriculture, fisheries, construction, manufacturing, waste disposal, distribution and transport we have exterminated many species, and the consequences for humanity itself hardly bear thinking about. There's been a lot of debate about global warming lately - it's a very explosive topic, but it's just one small aspect of overpopulation. Check out this population graph. You may not agree that we're already overpopulated. You may feel that we still won't be overpopulated in forty years time, when there are nine billion of us. But unless you love The Fifth Element and The Matrix so much that you want your grandchildren to live there, you really have to agree that this trend can't go on. And what's going to change it, other than a decision to have fewer children and buy less stuff? The main reason for current levels of population growth is the Green Revolution of the 20th century, which started when we began to make full use of oil for increased agricultural production. Our farming now depends on oil to build and run tractors, harvesters, dryers, chillers and other agricultural machinery, to produce fertilizers and pesticides, and to transport food to markets across the country or round the world. We have also developed crops with up to three times the yield of previous varieties. Without these advances, human population growth would already have been capped by famine, plague and war. So far so good, but nearly all fertile land is now in use, oil is now very expensive and it's still going up in price. It is said that oil reserves will run out before the end of this century. In some countries 20% of fertile land has been turned over to production of biofuels. Despite irrigation schemes, or in many cases because of them, desert land is spreading. At the same time, the UN Food & Agriculture Organization says that to avoid global famine we must increase food production by 70% in the next 40 years. FAO report How To Feed The World 2050. Some say "no problem, American and European farmers let apples rot on the tree because they're too expensive to pick, and agricultural subsidy systems often pay farmers not to produce food". America certainly produces enough food to feed itself and will continue to do so as long as the oil keeps flowing, but few European countries could produce enough food for their own populations, unless they add insects and vat-grown yeast to their diet. This became obvious on the outbreak of World War II when Britain's food imports were suddenly halved by the risk of German submarine attacks in the Atlantic and the need to use merchant ships for military cargos. Food rationing was introduced in 1940 and meat and bacon were still rationed in 1954, nine years after the war ended. The 1939-45 war proved that Britain could not feed her entire population despite Dig for Victory campaigns and the Women's Land Army to help with agricultural production. And the UK population back then was only two-thirds what it is now. In peacetime, wealthy countries avoid the problem by importing huge quantities of oil, food and timber from overseas. Even the USA is on the edge of becoming a net food importer. Let's get back to the 2009 Horizon program. David Attenborough said "as I see it, humanity needs to reduce its impact on the Earth urgently and there are three ways to achieve this. We can stop consuming so many resources, we can change our technology and we can reduce the growth of our population. We probably need to do all three." On the first point, consumerism has existed for only sixty or seventy years, not enough time for us to have physically evolved into Homo consumerens so we won't really suffer if we use our imagination and willpower to consume a lot less. On the second point, if we can't get a grip on our numbers then technological change can certainly help to feed us but it's likely to mean eating tasteless hydroponic vegetables (we've already perfected the zero-taste tomato) and farmed carp. By the time we're eating yeast grown in vats, willpower will probably start to look like a pretty attractive option. On the third point, the population trust Population Matters says the solution is simple. A couple should have no more than two children. But what are we actually doing? Well, several countries in Asia and eastern Europe have reduced their birthrate but other countries are slow to follow. The United States population is expected to increase 43% in the next forty years, from 308 million in 2010 to 439 million in 2050. 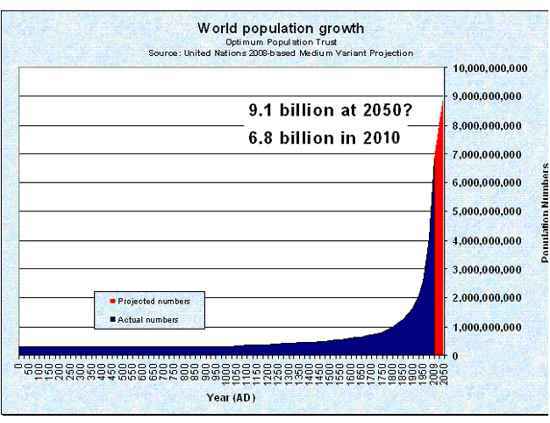 And as previously mentioned, overpopulation is about consumption as much as it as about numbers of people. Humans as a species have not so far demonstrated any ability to consume less than the max. Do you remember in 2006 when the newspapers all had a good laugh at the tiny Himalayan country of Bhutan for deciding to dump the Gross National Product as a measure of national success, and substitute Gross National Happiness? I smiled too, at the time, but I've just had a look at it while researching this page. As reported by Bloomberg Business Week, pre-industrial Bhutan of the mountains, forests, villages, Buddhist temples, 24 languages, 59% literacy and life expectancy of 62 was rated the happiest country in Asia and the eighth happiest country in the world. The people are very poor, but the state gives them healthcare and education which are funded by selling hydroelectric power to India and by charging tourists 200 USD a day. With an average annual income of 1400 USD hardly anybody in the country earns enough to pay tax. Your editor is not sure if they are happy despite this or because of it, but he has noticed that the richer people get, the less pleasant they are to their neighbors. In the same 2006 survey the US was only twenty-third because of the rich-poor divide and spotty health care. And that was in 2006, before the economic recession really bit down hard. NOTE - the above paragraph went onto the Kayarchy site on 9 November 2010. Three days later, the British government announced that it had asked the Office for National Statistics to prepare a quarterly assessment of the happiness of Britons. Prime Minister David Cameron said "it's time we focused not just on GDP [Gross Domestic Product] but on GWB - general wellbeing". So is Kayarchy spookily prescient or is the Prime Minister a keen reader? We don't have government agencies to deal with overpopulation. What we have is the exact opposite. There are government agencies to increase trade, industry and economic development; medical treatment for infertility; we have national constitutions and international conventions that say it's a basic human right to have all the children you want; a general rule that the more children you have, the more tax breaks and child benefit you get; ongoing religious objections to birth control; and average exposure of several hours a day to advertising in newspapers, TV, magazines and online services that are funded by industry and retailers. All of which is about as uncool as it is possible to get. Homo sapiens, we call ourselves. The wise man. Ouch. We love to watch wildlife programs on TV. We prefer not to be told that most of the iconic animals that we love to watch are now counted in thousands, not billions or even millions. Many of them are under direct and immediate threat of extinction. Not since the die-off of the dinosaurs have so many species been on the road to extinction. The more of us there are, the less room there is for other species. The UN says we need to increase food production, and in a search for sustainable ways of fueling our new consumer lifestyles we are also growing more biofuel crops. Putting more land under the plough means more habitat loss, more runoff pollution from agriculture, and goodbye to many nature reserves. For wildlife, our most destructive activity is clearing forest and grassland for farming. A species that has lost most of its habitat can be pushed to the edge of survival by more intensive farming practices, pesticides, industrial pollution and legal hunting. At that point highway deaths, illegal hunting, litter and even eco-tourism can become significant factors. In environmental terms, if the question is whether hares, tigers or wolves are endangered, the answer depends whether you're right-wing or left-wing, whether you are a farmer in what was formerly hare, tiger or wolf country, and whether you expect to have difficulty keeping up the payments on your house. Although the number of hares in the UK has been reduced by 98% since 1930 and they are locally extinct in much of the country, it is still legal to shoot them for sport and to protect crops. And although there are now only 5,000 wolves altogether in the lower 48 states of the USA (that's one wolf for every 61,600 humans... or one wolf for every 15,000 pet dogs) they have been briefly removed from the US endangered list on four occasions in recent years. Yes, that's right, by the time your grandchildren want to visit any of Africa's game reserves there's a good chance there will be no more lions, elephants or cheetahs except in small wired compounds. The more serious IUCN risk categories are threatened, near endangered, endangered and critically endangered. The last of these categories is next to extinct and often means that the species now survives only in a zoo or has not been seen for some years. None of these categories include local extinction. If a species has been exterminated across most of North America and Europe but there is still a healthy population in Greenland, it is not considered to be endangered. And this is just a very small sample, chosen because we like to watch them on TV. The extinction list of apes, monkeys, amphibians and small creatures is so long it's hard to know where to start. Kayarchy's UK site has some additional information about the current problems of North Atlantic seals, otters and sea and estuary birds. Click here. Most of what follows is from another TV program by David Attenborough in the BBC's Horizon series, first broadcast on 4 October 2010 and entitled The Death of the Oceans? Only 4% of the oceans (mainly in the Torres Straits and along the north coast of Australia) have not so far been significantly harmed by human activities. Areas where marine ecosystems have been particularly badly hit include the waters round New England, Alaska, Iceland, China and Japan, and the North Sea and the Mediterranean. CoML researchers identified 6000 new species of worms, fish, weed, etc, some of which are already heading for extinction. Perhaps even more important, the Census revealed connections between species that help us to understand what keeps the trophic web together. Columbus crossed the Atlantic in 1492. After Cabot explored further north in 1497 every fisherman in Europe soon heard about the Grand Banks fishing grounds off the east coast of America, and the rush was on. Fishing fleets found the same familiar species of fish as at home, but they were astonished by their numbers and size which made it worth sailing thousands of miles across the stormy North Atlantic and salting their catch down for storage. In the 16th century many European whalers hunted bowhead whales off the coast of Labrador. Many fish and marine mammals live a long time, and it seems that bowheads can live two hundred years. Examination of bowhead whales killed in 2007 revealed ivory harpoon heads that were plunged into them in the days of sail, and an explosive harpoon head made in New Bedford in 1890. 19th century commercial whaling in the Pacific wiped out 60% of bowheads in twenty years. Commercial whaling was made illegal in 1966 but overall the bowhead is still an endangered species. By 1859 fishermen in Maine were so concerned about dwindling stocks of fish that state regulation of fisheries was introduced. Even so, during 1871 fishermen in the Gulf of Maine landed a total of 70,000 metric tonnes of cod using sail, oar and hand-lines. Today, fishermen in the Gulf of Maine land only 4,000 metric tonnes a year despite using powerful steel fishing boats and electronic fish finders. Some fishermen argue that quotas should be increased for species which have increased in numbers since semi-effective regulation was introduced twenty years ago, but others point out that this increase is nothing compared to the steady downward slide caused by overfishing for the previous 100 years. "If present trends continue, commercial fishing as we know it will have collapsed by 2050". Professor Jeffrey Bolster of the University of New Hampshire. It's not just Maine. Fish stocks globally have been drying up for decades and many species have reached the point of collapse. In 2007 a briefing by the Executive Director of the United Nations Environment Program predicted "a global collapse of all species being fished by 2050, if fishing around the world continues at its current pace." Back in Europe in the 1830s, sail-powered fishing boats were regularly landing loads of shad, haddock, sturgeon and salmon in the North Sea. These were fished to local extinction between 1850 and 1910, partly as a result of increased demand after the European railway network was built in the 1840s and partly from the introduction of steam-powered trawlers. Ling are still caught in the North Sea but those now being caught weigh about one-quarter as much as those being landed in 1840. Without fishing, cod naturally reach six feet long and 140 pounds weight. However the average cod now caught in the North Sea weighs 2.5 to 5.5 pounds and is less than 3 years old. They are caught before they are old enough to breed. Canada has at times suspended cod fishing over large areas in an effort to preserve stocks. In the 1950s and 1970s Iceland decided to protect its fisheries by extending its territorial waters out to 200 nautical miles from the coast. British fishermen were not happy about this, resulting in "Cod Wars" with many dangerous incidents at sea. Of course Britain took a similarly protective attitude to fish stocks in its own territorial waters, severely undermined a few years later when European Union fishing policies gave Spanish and French fishing fleets free access to those areas. During World War II, Atlantic cod populations rapidly recovered when fishing was reduced for six years, but the situation now seems to be worse. According to Wikipedia "several cod stocks collapsed in the 1990s (declined by more than 95% of maximum historical biomass) and have failed to recover even with the cessation of fishing...Many other cod stocks remain at risk. The Atlantic cod is labelled VU (vulnerable) on the IUCN Red List of Threatened Species". Worldwide, top predators such as tuna and some sharks have been reduced by 90% in the last fifty years. Which may seem like good news for smaller species that were eaten by them, but it's not as simple as that. Removing one level of the trophic web is just as likely to be bad news for the rest of the ecosystem. The human activities that harm marine species are over-fishing, the death of small fish thrown back because they are under the regulation size, "bycatch" of other species such as dolphins and turtles that are trapped by abandoned fishing gear, destruction of habitat by trawls, industrial and agricultural pollution, marine pesticides used by merchant shipping and fish-farms, acidification of the oceans by rising levels of CO2 in the atmosphere, climate change, and production of oil & gas. We have never really given credit for the fact that marine species tend to live a long time, take some years to reach breeding age, often have quite a small territory, and are vulnerable to all sorts of damage from physically dragging a heavy trawl over the sea bed, through propellor injuries caused by high-speed leisure craft and by larger ships maneuvering in shallow water, to ship engines that make the ocean a noisy place. Dissection of dead whales and dolphins often indicates that they have noise-induced hearing loss, just like a human who has worked for many years in a noisy factory. This threatens the survival of any animal that hunts by sonar. The oceans are a lot more than just home to cute or weird animals. Covering 70% of the surface of the planet, they are its heart and lungs. In the words of Dr Andrew Rosenberg of the Census of Marine Life "the oceans are literally the support system for all life on Earth. If you don't care about the oceans then you're basically saying 'I don't care what happens about life on Earth'." We are running out of time to moderate our own behavior. Professor Ove Hoegh-Guldberg of the University of Queensland, a marine biologist and expert on the Great Barrier Reef, says "we are right at the moment where if we go any further we will not be able to save the oceans, and that will be at great cost to ourselves, but right now we can do a lot". So far we have been very good at exploiting the world around us; quite good at scientifically measuring the decline of other species; but not so good at doing anything about it. We make pretty wildlife programs for TV that take care not to mention that we are exterminating these species. Each of us knows a lot about work, cars, sports, music, celebrities, scandals, history, politics, crime, archaeology, psychology, home improvements, hobbies and foreign holidays, but few of us know anything about protecting wildlife habitats. Except for a few Himalayan buddhists, all seven billion of us measure our personal and national success by economic growth. Zero growth risks a catastrophic slump into economic depression. Unfortunately economic growth doesn't necessarily make you happy; it is more or less the same thing as environmental destruction; and even as an economic model, it just isn't sustainable. In a world with finite resources, you can't continue to increase industrial production by 3% per annum, forever. Our governments know this perfectly well, but nobody wants to lose competitive advantage by being one of the first to reduce production. The largest consumers want to be the last to reduce production, hence the refusal by the USA to ratify the 1997 Kyoto Protocol on reduction of greenhouse gas emissions. The USA is the largest producer of greenhouse gas, emitting about twice as much as China, although China is catching up fast. Australia has ratified the Kyoto Protocol but not brought in any legislation to implement it. One way or another, our attitudes will have to change. It would be great if the seven billion of us made a joint decision to change, because then we could change in our own time and keep all our culture, technology and knowledge. However that's about as likely as us learning to levitate. Even small new ideas have to go through a period of ridicule, followed by violent attack before they are accepted as obvious and inevitable, and we're talking about the biggest cultural change since the Industrial Revolution. Your editor has a nasty feeling that we will focus on other things until our grandchildren witness the collapse of the current system. And it's not as if we don't have plenty of other things to focus on - economic recession, political and religious extremism, urban decay, bad housing, drugs, crime, policing, terrorism, new towns, pollution, health issues, work, stress, road rage, bullying, rising food prices, famine, drought, flood, oil spills, oil shortages, genocidal wars. How many of these problems are actually signs of overpopulation? They say those who don't study history are condemned to repeat it. Every previous culture which lived a sustainable existence in balance with its resources was overwhelmed by the consumer society next door. Tibet, most recently. And every consumer society used up its own resources, expanded to get hold of more resources, got too big and was taken down by outsiders with little to lose. That includes the Hittites, Assyrians, Sumerians, Persians and various Chinese, Roman, American, French, British and Russian empires. Modern humans evolved anything from 50,000 to 200,000 years ago, depending who you believe. Either way, that's the blink of an eye for a species. Most of our fellow creatures have existed in their current form for between a hundred and a thousand times as long. Horses have been around for 10,000,000 years and that's not much. Most species have been around, with slight variations, for 20,000,000 to 50,000,000 years. Dragonflies have been here for 325,000,000 years. The first humans didn't set foot in Europe until 40,000 years ago. 12,000 years ago none of us had discovered farming and there were still very few humans, mostly living a very primitive existence. We're fast learners, though, hence the damage we have done in the last 150 years. David Attenborough notes that "in the oceans we have depleted fish stocks massively. 10% of the world's coral reefs are estimated to be degraded beyond recovery. A third of the world's amphibians, a fifth of all mammals and 70% of all plants are currently under threat of extinction". The November 2009 press release from the International Union for the Conservation of Nature confirmed that of 46,677 species of animal and plant surveyed around the world, 36% are threatened with total extinction. It's time we got a grip, for our sake and theirs. Sea kayakers especially are drawn to remote and misty coasts with no industry and little tourism, where we can take a deep breath of fresh air and see our favorite animals and birds. Until the 17th century, marine and coastal wildlife was present in large numbers around the coasts of Europe, Scandinavia and America. Today, remote and misty areas are their last sanctuary outside the Arctic. European otters were common even in the 18th century but are now listed as "decreasing, near threatened". 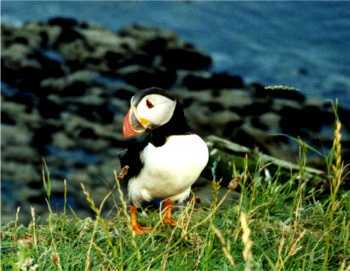 Puffins and other iconic seabirds are rapidly heading for local extinction. 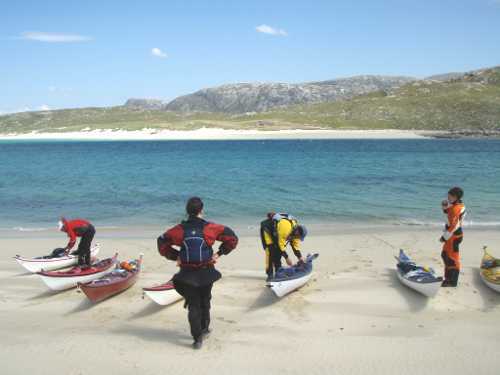 Sea kayakers can slip into places which are inaccessible to hikers and larger boats. We sometimes cause harm without realizing it. We need to take care so that coastal creatures can live, breed and hunt without extra disturbance. Too many human visitors can make a species abandon a beach or cliff where it has bred for thousands of years. Individual parks generally have their own rules and regulations. Federal law applies to national parks in the USA under Title 36 - Parks, Forests & Public Property which can be seen on the Government Printing Office website. Last time we looked, the Title 36 pages started here. Section 2 has regulations about preservation of natural, cultural and archaeological resources; unauthorized hunting and fishing; camping and food storage, picnicking, fires, sanitation and garbage. Parks Canada comments "many tour operators are affiliated with an industry association which has codes of conduct, standards and certification for guides. Certain protected areas require commercial operators to obtain permits and meet guide standards, such as Gulf Islands National Park Reserve, where guided trips require certified guides." In both the USA and Canada there are regulations about harassment of marine mammals including sea otters, seals, sea lions, dolphins and whales. In the USA, federal and state legislation is based on the Marine Mammal Protection Act of 1972 (download here) and 50 CFR 216, the Regulations Governing the Taking & Importing of Marine Mammals (download here). The definition of taking includes harassment and "any other negligent or intentional act which results in disturbing or molesting a marine mammal; and feeding or attempting to feed a marine mammal in the wild". Over the border there are the Fisheries Act, Marine Mammal Regulations and the Species At Risk Act (SARA). Parks Canada notes "marine mammal regulations prohibit the disturbance of marine mammals, including seals and sea lions. The proposed amendments further define 'disturb' to include: feeding, touching and entering the water with the intention of swimming or interacting with marine mammals. People must not approach whales within 100 meters or disturb seal or sea lion haul outs." The LNT site also has the inspiring message that leaving no trace is not just about not doing things - you can benefit from getting involved in community action. • The Mountaineers (Seattle) Sea Kayaking Committee. Last time we looked, the wilderness ethics code was here. • Kit's Kayak Crusades. This Vancouver outfitter has expanded the seven LNT/NOLS principles in a way which applies to sea kayaking and could be adopted by individuals or clubs. Click here. • The Sea Kayak Association of British Columbia has conservation resources here. Government organizations in Tasmania have produced guidelines for sea kayakers which reflect local conditions and the views of conservation and leisure groups. See the website of the Tasmania Parks & Wildlife Service. Last time we looked the MISK (Minimal Impact Sea Kayaking) document was on this page together with breeding sites and times for marine mammals and birds. Similar documents have been put together by commercial kayaking organizations elsewhere in Australia, New Zealand and North America. The Hebridean islands of Scotland have a small population and little tourism, but even so their natural environment has real problems, not necessarily caused by local people. 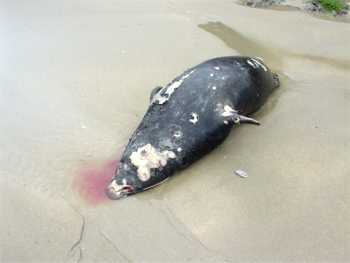 Problems include over-fishing, abandoned fishing nets and tackle that kill marine mammals (bycatch); roadkill; habitat loss; use of agricultural and marine pesticides; pollution by dioxins and PCBs; oil spills; introduced species such as mink and rats; disturbance of nests; and shooting and poisoning of birds of prey. As far north as Shetland, puffins, arctic terns, arctic skuas, kittiwakes and gannets have experienced a massive population crash in the last couple of years. This is believed to be caused by over-fishing, global warming and pollution. In France, Brittany is a natural focus for sea kayakers from half of Europe. It also gets a lot of general tourist traffic, afoot and afloat, and has been unlucky with oil spills. After the infamous "black tides" only 400 pairs of guillemots remained in the Sept Isles. Now there are only 12 pairs on Rouzic. Conservation authorities have responded by prohibiting fishing and camping on many of the smaller islands, and establishing exclusion zones round seabird colonies. Most of these areas are marked off with lines of yellow buoys and/ or warning signs, indicating "no access" from 15 March to 31 August. Little is known about the effect of eco-tourism on wildlife. In Scotland, high-speed tour boats run visitors out to have a close encounter with the dolphins of the Firth of Forth. The number of dolphins in the colony has recently been decreasing by 6% per year, and if the trend continues the colony will be extinct in less than fifty years. But is this the result of tourism, or of other factors such as overfishing or pollution? Or could it be the noise of seismic surveys and ship movements connected with the North Sea oil industry? Dolphins use sonar to communicate and to sense the location of other members of the pod, underwater obstacles and fish, so in the words of the international scientific director of the Whale & Dolphin Conservation Society"if you think of a herd of deer being chased by Land Rovers honking their horns, that gives you some idea of what it's like for them". It has been suggested that eco-tourism in the Antarctic is having a bad effect on emperor penguins, but it could equally be a number of other things such as overfishing and pollution. It is clear that when human visitors disturb a coastal animal or bird and make it run, they reduce a creature's chances of breeding, or even surviving. Many creatures are known to be particularly stressed by human contact, from otters to the sanderling population in the next photo. • The reason for the "no go" zone. • Its location, with a good sketch map. • The start and finish dates for the exclusion. • The distance a kayaker should keep away. For south-west Wales, there is a Marine Code For Kayaking with agreed access restrictions to limit stress for seabirds, seals and cetaceans. See www.pembrokeshiremarinecode.org.uk or download the Code as a PDF. • Scottish Marine Wildlife Watching Code, which sets out general advice for hikers, boaters and divers. • A Guide to Best Practice for Watching Marine Wildlife, which contains specific advice about particular species including such as cetaceans, basking sharks, seals, birds and otters. • Where to 'Go' In The Great Outdoors (which could be sub-titled How to Sh*t On The Beach). Any code of conduct for sea kayakers comes down to this. • Don't cause physical damage to the environment. • Know when animal populations on beaches, cliffs and mud flats are vulnerable to disturbance, and give them a wide berth. • If you're close enough to watch wild animals or birds and take good photos without specialist equipment, are you too close? See Binoculars. • Don't leave trash or debris to spoil the experience for others. A code of conduct needs to suit local conditions and be acceptable to kayaking groups, individual kayakers and environmental agencies. In a sensitive and heavily-used area such as a national park there are likely to be exclusion zones and rules that beach fires are never acceptable, if camping is permitted it must be in a very small tent which is taken down at sunrise, and there may be a requirement that all human waste including feces is to be carried back out for disposal. Take all food packaging, wine bottles, disposable barbecues, etc, back out with you. Orange peel and paper kitchen roll can take two years to decompose even in a temperate coastal climate, and twenty or thirty years in a semi-arid climate. In any part of the world, if you hide toilet paper or feces in a plastic bag or under a rock, it will take forever to decompose and may offend a later visitor. In a crowded area, either bury them with a trowel or take them back out with you. In a wilderness area, feces can usually be left where the next high tide will wash them away. Sea water works just as well as toilet paper, but if you do use toilet paper it should either be burnt or put in a plastic bag and taken back out with you. If for some reason it is not practical, take a roll of toilet paper which is designed to disintegrate quickly. 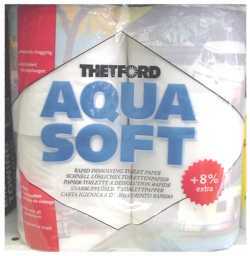 It is sold for use with chemical toilets and is easily available from camping and auto accessory stores. In sensitive areas, don't light fires. See for example the code of conduct for Brittany, below. Elsewhere if you light a fire, use driftwood or dead wood if it is available. Unless you are in a real wilderness area which gets few visitors, don't break branches off trees. Make your fire on the beach so it does not damage vegetation or set fire to grass, heather or peat. Make it below the high tide line, so that the next high tide will wash away the remains. Bear in mind that the underside of a disposable barbecue gets hot enough to set fire to any wood or vegetation it stands on. 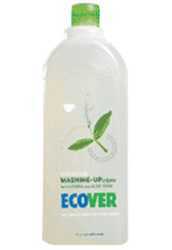 You can wash dishes with an environment-friendly liquid such as Dr Bronner's or Ecover. These bio-degrade rapidly and are only minimally harmful to aquatic life. Ordinary dishwashing liquid is amazingly bad for the environment and pretty unkind to your hands. If you haven't discovered Dr Bronner's or Ecover yet, they are just as effective as ordinary dishwashing liquid, better for the environment and your skin, and they smell good. We mentioned the Leave No Trace organization. LNT started in the USA and has international organizations in Australia, Canada and Ireland. Written to suit local conditions in Brittany, France. Co-written by environmental agencies and sea kayakers. Adopted by CK/Mer, and the "Point Kayak Mer" network of the Comité Régional de Canoë-Kayak de Bretagne. Be courteous at all times and respect other users. Offer to help anybody who seems to be in difficulty. Greet other seafarers; it’s an old tradition of the maritime world! Take the time to find out about any relevant regulations, and respect both the regulations and private property. When planning a trip, take account of any rules that apply to sites you intend to visit. You can find out what they are by contacting wardens or organizations responsible for managing nature reserves and other wild places. Never camp on an island less than 60 meters in diameter, or one occupied by colonies of birds or seals during the breeding period from March to the end of August. On land, avoid nesting areas and the beaches where seals breed and have pups. Choose any overnight camp site with care. Don’t leave your tent there for more than one night, both to reduce its impact on plants and wildlife and to avoid encouraging others to set up camp away from authorized camp sites. Take all rubbish away with you and make sure, on leaving your camp site, that you leave no trace of your visit on a sensitive and fragile site (particularly on the vegetation). Deal with your own wastes, and never leave anything on the islands, whether they are inhabited or not. Don’t go closer than100 meters to wildlife. Never touch a marine mammal, even if it approaches you, for reasons of hygiene and safety. When near animals, reduce speed and keep the noise down. Never surround them or chase them. As far as possible, keep to the same course; decide at the planning stage which channels you are going to take; and don't point your kayak directly towards birds or animals. Keep traveling, to keep disturbance to a minimum. Withdraw quietly if you see signs of anxiety or panic on the part of wildlife (prolonged calls, dive-bombing, attempts to draw you away and, in the case of dolphins, uncoordinated leaping). The coastal environment is sensitive. Avoid activities which may damage it. If you see rare plants or wildlife, or significant environmental problems, or you have questions relating to the natural world, contact the management organisations or warden. That way, you participate in our understanding of the natural environment.